Clear-Lead™ Personal Mobile Barrier showing height adjustment range. 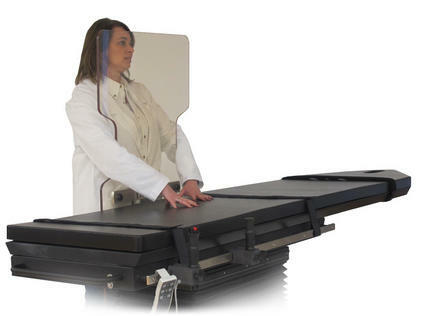 The unique hourglass contour of the Personal Mobile Barrier provides “hands-on” patient access while providing radiation protection (0.5 mm LE) where it’s needed. This versatile, lightweight barrier offers the distinct convenience of height adjustability to protect the user, whether seated or standing. This feature is an essential advantage for all urologists, anesthesiologists, pain-care physicians, x-ray technologists and more. 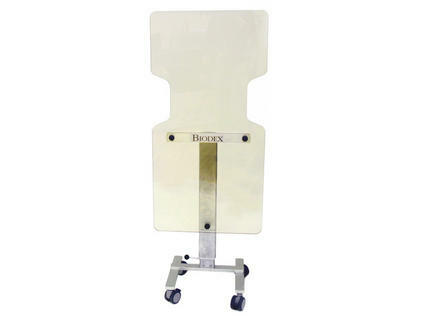 Constructed of Clear-Lead™ acrylic, the window is anatomically positioned with cutouts for the user’s arms to maintain continuous hands-on contact with the patient while maximizing protection. Featuring an easy-roll, four-caster base and two grip handles, the lightweight barrier (51 lb) is easy to maneuver and positions flush to the table for total patient access.